Arshia Khan’s new textbook helps students learn to develop mobile apps with medical and business relevance. Apps like Angry Birds and Words with Friends are fixtures on college campuses. But medical management apps? Not so much. Due to be released on Feb.15, the textbook combines Objective C – the core programming language used to develop mobile software (including Angry Birds) for Apple devices such as the iPhone and iPad – with iOS, the primary platform for these devices. Seeing this gap, publisher Cengage Learning reached out to Khan to write this first-of-its-kind book – possibly because she’s already incorporating many of the ideas into her classroom at St. Scholastica. It’s this sort of interdepartmental collaboration that this book hopes to foster – teaching students to develop apps that serve a meaningful purpose in people’s lives. And according to Tami Lichtenberg, Executive Director of Health Care Innovations at St. Scholastica, that’s exactly what Khan’s book and work as a whole are doing. “Many computer science textbooks don’t do a good job integrating real business applications,” she said. “Dr. Khan's approach is important because healthcare app builders need to be able to envision the client's needs and expectations beyond the structure of the code. So teaching iOS in an interdisciplinary manner will give students an advantage in the marketplace." And that’s not the only thing giving St. Scholastica students an edge. 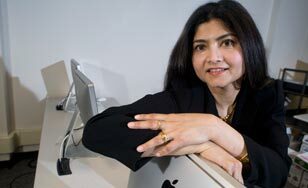 Khan and her colleagues are ensuring students leave the College with a thorough knowledge of the current computer science landscape by incorporating the most pressing issues and topics in computer science – like security, big data and cloud computing – into the curriculum.